I had the great privilege of co-hosting a baby shower for our sweet friend Christina M. Her little boy is due on tax day this year. We were pregnant together for 2 of my trimesters which had been super fun walking through my first pregnancy with someone else close by. As it turns out, four out of the five couples in our small group are going to be first time parents this year. Its funny because when we started our group back in September Ben and I were the only ones pregnant- what a crazy, fun year God had planned for our group! 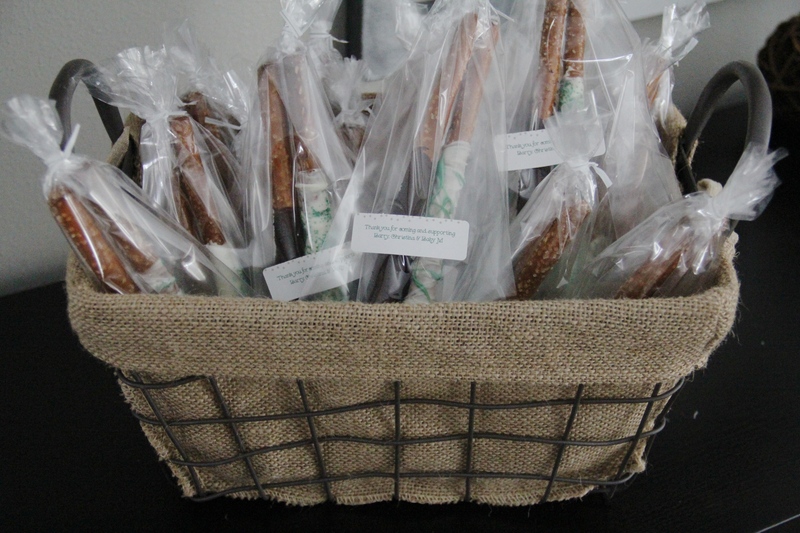 It’s a sweet little time in our lives to be sharing with some of our closest friends. Here’s the four of us who are having our babies this year. Christina’s overall theme for her nursery has a lot of natural/rustic elements to it so when we were planning for the shower Anna-Cheri and I wanted that to translate in our decor. Her colors are grey, a steely blue, and a forrest green. 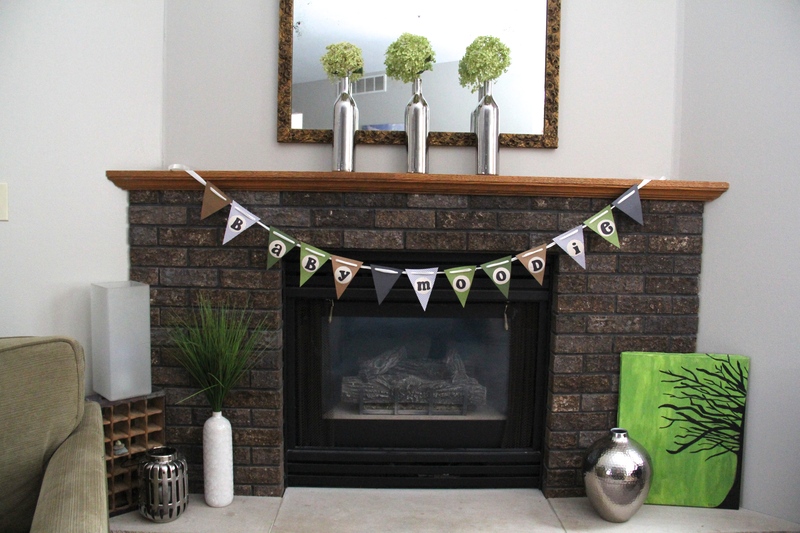 Anna-Cheri made a banner for the mantel with those colors that turned out really cute. 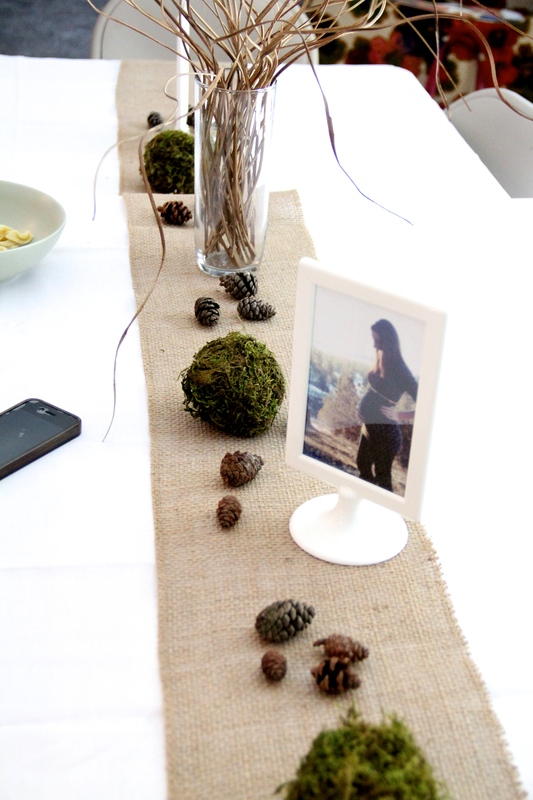 For the table decor we put down white table cloths and put a burlap runner down the center of the tables. Anna-Cheri’s sweet hubby dug in the snow to find us some mini pinecones to add on the tables. (THANKS DARREN!) I had covered some decorative balls with moss for my spring decor so I placed those on the table as well. Lastly, I printed out some pictures of Christina from her pregnancy so far and displayed them in white Ikea frames. 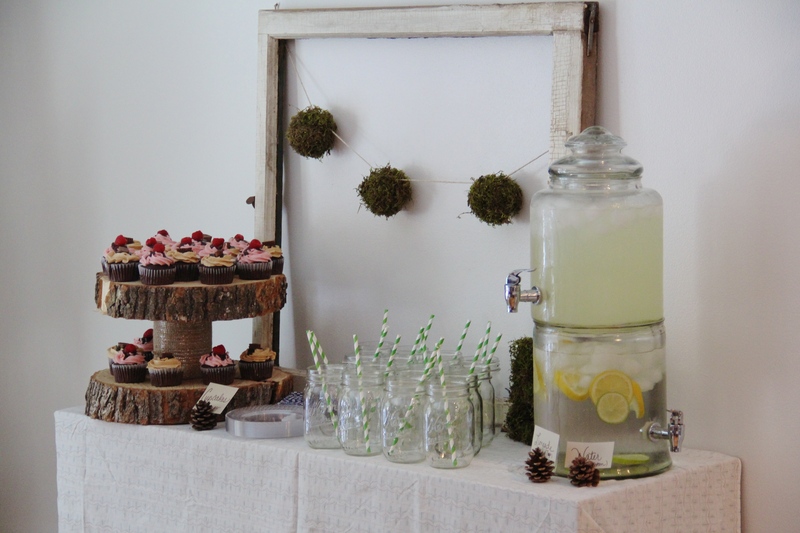 For the drinks and desserts table I used more of my spring decor- an old window frame that I hung more mossed covered balls from. 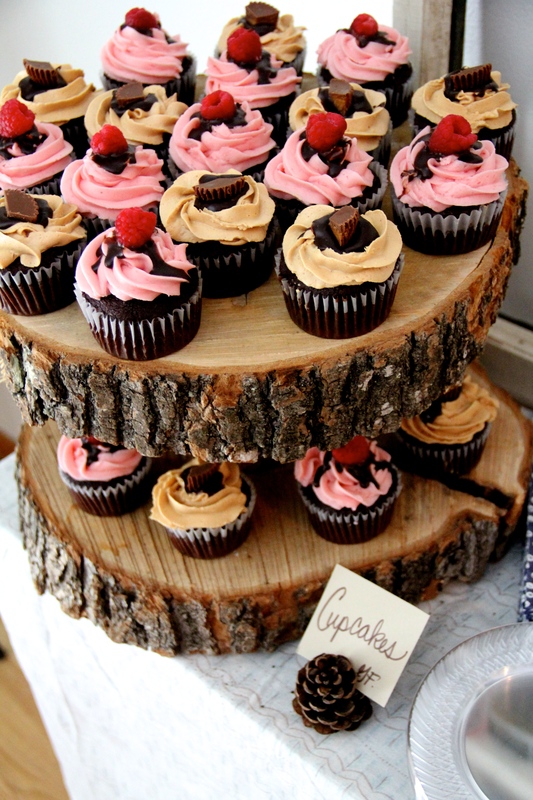 The cupcakes were displayed on cut rings of wood that were actually used for my shower earlier in November seen here. Anna-Cheri made the chocolate raspberry and chocolate peanut butter cupcakes-both were delicious. 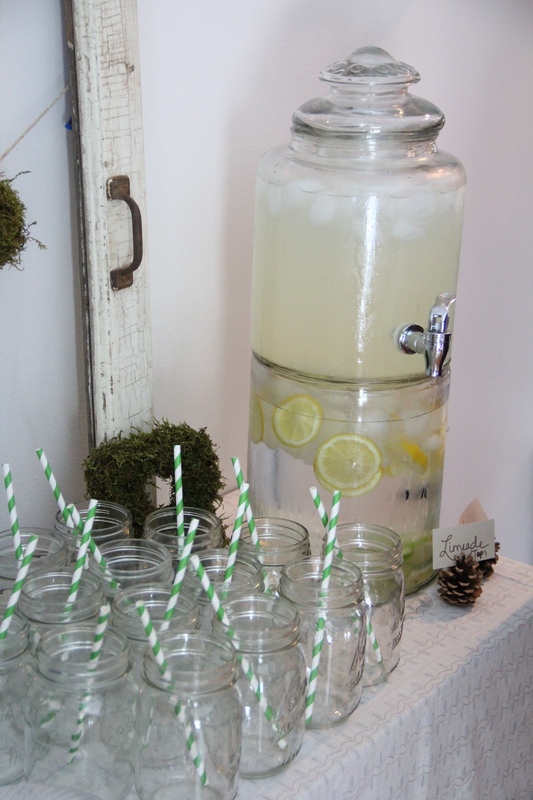 We used mason jars for the glasses and had green striped paper straws. Lastly, we served water and my famous limeade for drinks. Recipe for limeade can be found here. We used big pinecones as a way of displaying the different food and drinks. For food we went with a simple soup and salad menu. 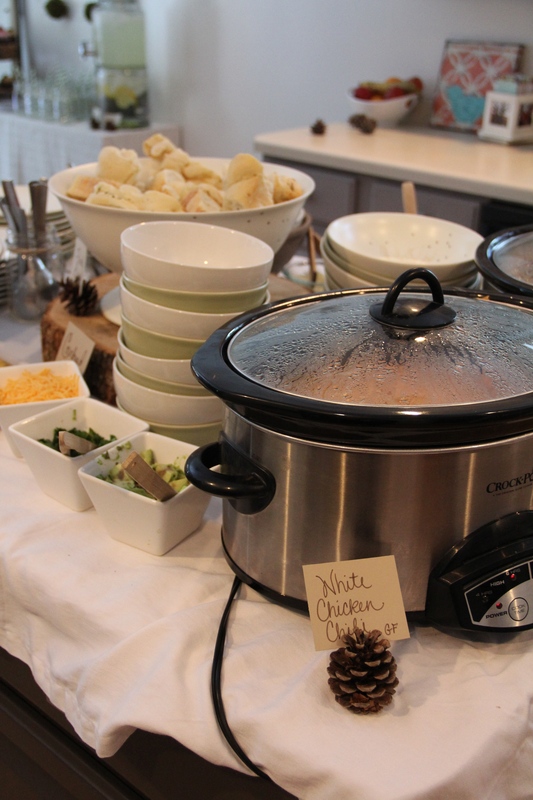 We had two different soups of white chicken chili and sausage tortellini (recipe here). Salads included a caesar and a fruit salad. 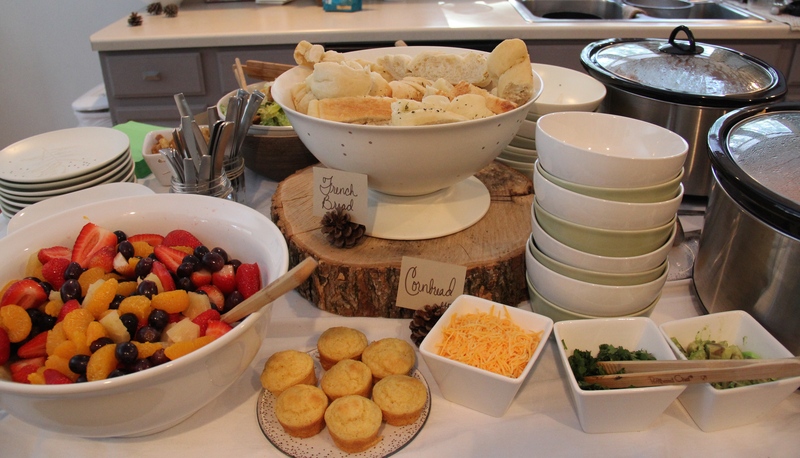 We also served gluten-free cornbread and regular french bread. Again, we used the big pinecones for displays and the ring of wood to add some height. We did end up playing a few shower games. 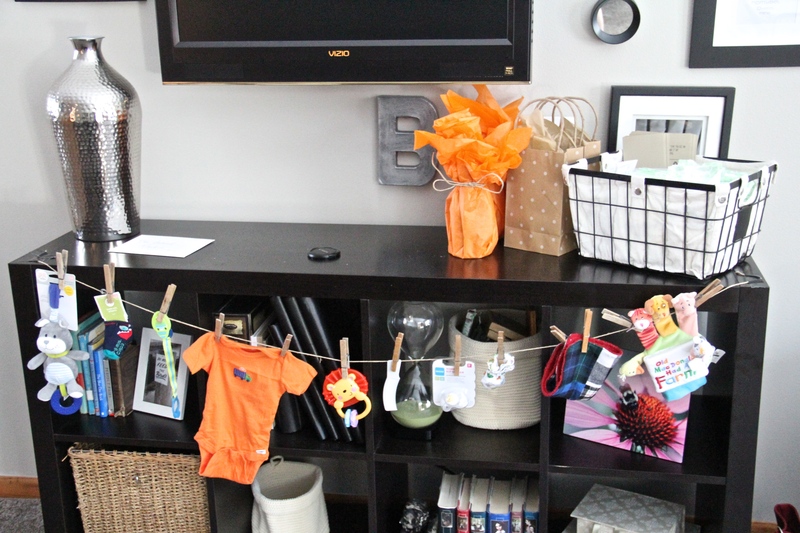 One was a clothesline game in which we strung 10 different baby items in plain sight for the majority of the shower. Then unannounced, we took the clothesline down and handed each person a slip of paper and a pen and told them to write down what they could remember from the clothesline. We also played bingo as she opened up her gifts. 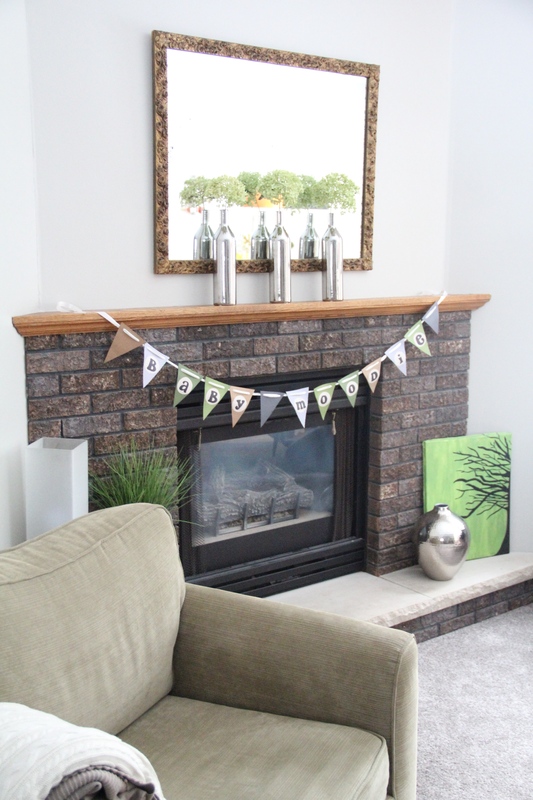 I found a fabulous little woodsy free printable version on Pinterest. Lastly, we passed around some sharpies and diapers for people to write a little message to Christina and Barry on the diaper. We also did this at my shower, and it was so fun to read them during our middle of the night diaper changes. 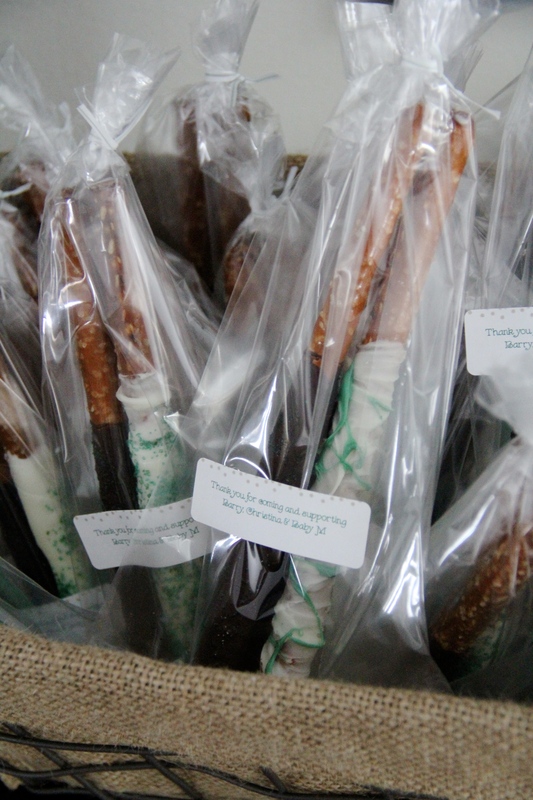 As take-a-ways we made pretzels covered in white or dark chocolate and sprinkles. I didn’t end up capturing the devotion time we had, but one of the best parts was a sweet little devotion Cindy gave for Christina. She had come up with different items that went along with scripture to help remember God in the day-to-day activities of being parents. Thanks Cindy! 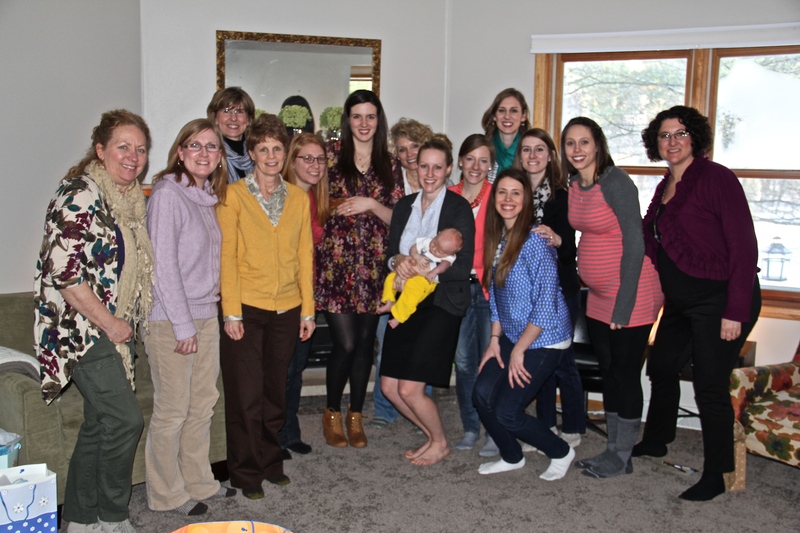 Overall the shower was a success and such a sweet little blessing to the soon-to-be parents. 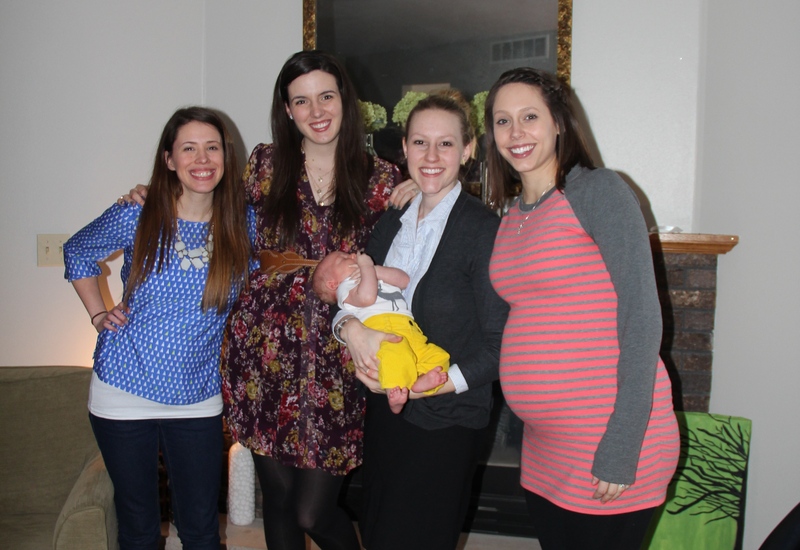 We loved being able to celebrate the little life God’s knitting together. We are grateful to have Christina and Barry in our lives and we wish them all the best for a safe and healthy delivery coming up. 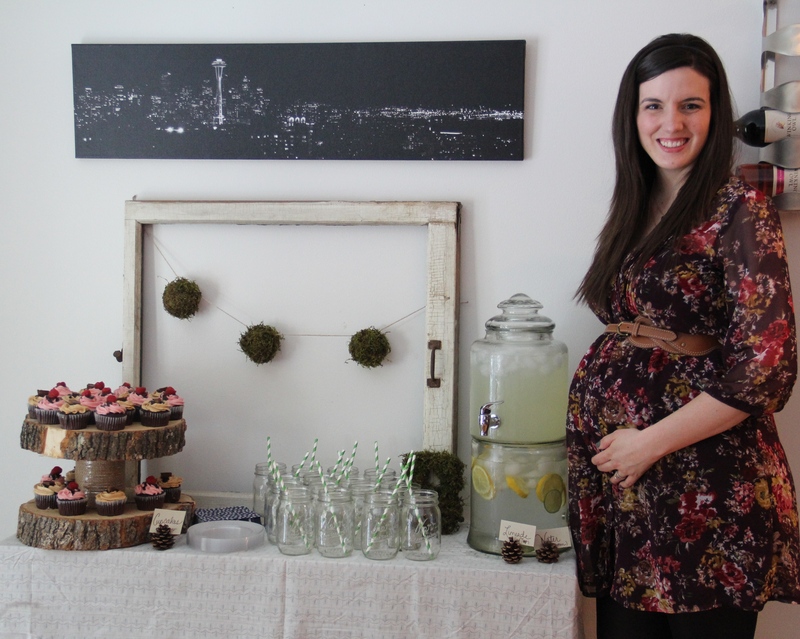 Christina you are truly glowing and we can’t wait to meet your sweet little boy!